In our continued coverage of the ridesharing industry, Envision IP recently analyzed Uber and Lyft’s patent portfolios. Since our last review in December 2015, the company has significantly increased its patent holdings via both acquisitions and organic filings. Uber currently owns 144 US patents, sparked in part by a major acquisition of 66 patents and 10 patent applications from AT&T in January 2017. The USPTO assignment record dated February 8, 2017 for this acquisition can be found here. Each of these five patents have a priority date of June 24, 2003. The acquisition is notable as it gives Uber significant patent protection not only for various agnostic technologies that are employed by its ridesharing platform (i.e., messaging, networking, status updates, etc. ), but also protection on relatively broad aspects of location-based matching of passengers with drivers. 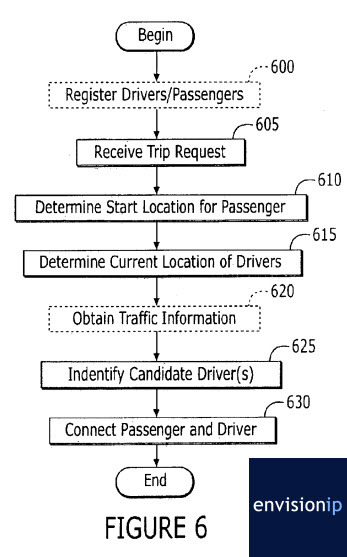 While the priority date does not reach back to Sidecar’s US 6356838, which is now owned by General Motors, it does provide Uber with seemingly fundamental patents for its industry. In addition to the AT&T patents, Uber also recently acquired 11 patents from Apparate International C.V. related to various autonomous vehicle technologies (such as route planning, sensors, drive-by-wire controls, and LIDAR), and 9 patents from Palo Alto Research Center related to rideshare matching, payments, and driver/passenger security monitoring. The Palo Alto Research Center patents all have 2007 priority dates. In stark contrast, while we reported that Lyft had obtained its first US patent last August, the company does not have any publicly reported patenting activity since then. Based on our analysis, Lyft currently has one issued US patent (related to a driver jukebox system), and two pending, published patent applications. Uber appears to be doing an excellent job at identifying and acquiring third-party patents and patent portfolios which complement its platform. The company had previously acquired patents from Microsoft and deCarta. The latest patent acquisitions provide Uber with defensive patents that may help the company counter patent infringement attacks from competitors and other operating companies. These patents solidify Uber’s patent dominance against Lyft, and may provide Uber further strategic leverage as the two companies continue to battle for the ridesharing market. It will be interesting to see if Lyft responds with patent acquisitions of its own in the near future, possibly fueled with a new round of potential funding.